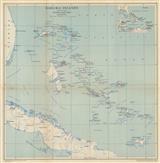 Description: Elegant copper-engraved sea chart of Antigua, produced for the French navy by J.N. Bellin, Hydrogapher to the King. Description: This important and rare map of Antigua was a predecessor to the more usual map present in the West India Atlas. This piece was included in his work, General Topography. Coloured. Description: Uncommon Spanish map of Antigua with major towns, churches, and plantations marked. Coloured. 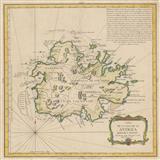 Description: The island of Antigua divided into its parishes. Produced by Bryan Edwards, a wealthy sugar planter and historian, for his "History of the West Indies". Coloured. Description: The Bahamas and the Turks & Caicos. 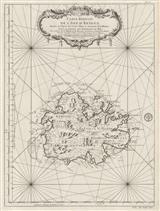 Handsomely-engraved map with depth soundings and reefs marked. Original hand colour. 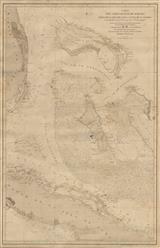 Description: Large map of The Bahamas with inset maps of New Providence and Nassau. Printed colour. Description: The Bahamas. Published by the Directorate of Colonial Surveys and printed by the War Office. Printed colour.